Guess what? It’s our 20th Birthday! 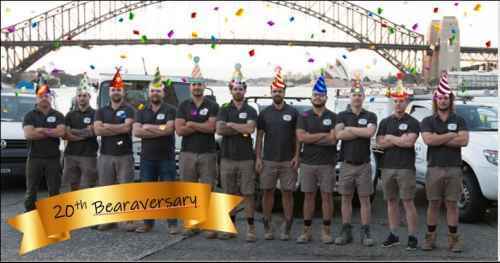 Bear Plumbing started in 1998 – what a year! Let’s take a trip down memory lane. In 1998, Australia’s population was 18.7 million (compared with just over 25 million today) and John Howard was Prime Minister (for somewhat longer than our current run of PMs!). The median house price in this country was $157,387, a loaf of bread cost $1.37 and unleaded petrol was 59c per litre. We were bopping along to Ricky Martin’s “The Cup of Life”, rocking out to The Living End’s “Second Solution” and slow dancing to Shania Twain’s “From this Moment On”. You probably went to the movies to see Saving Private Ryan, Armageddon and Deep Impact, while your TV was likely switched to Friends, ER, The X Files and the final season of Seinfeld (feeling old yet?). France won the World Cup (in France), the Brisbane Broncos won the NRL Grand Final, Queensland won the State of Origin series, the Adelaide Crows won the AFL Premiership and Jezebeel won the Melbourne Cup. Our company’s history stretches back almost 40 years, but we became Bear Plumbing in 1998, partnered by Brett Matthews and Andy Gonzalvez, who have well over a quarter of a century of plumbing experience between them. We based our business on ethical conduct, skilful tradesmanship and strong working partnerships with both our corporate and residential clients. Q: What’s your number one piece of plumbing advice that every household should follow? Over the years, we’ve seen some exciting developments on the plumbing scene, with Bpress fittings and improvements in diagnostic equipment and pipe location just a few of the things that have made our work more efficient. Brett: Over the last 20 years, we’ve been constantly evolving and growing. Andy: There’s never a dull moment at Bear Plumbing, that’s for sure! For twenty years, we’ve been built on service and we’ve stuck true to our core values – we provide exceptional tradesmen who are courteous and reliable, finish the job on time, clean up before they leave and, most importantly, listen to your needs. We have a close-knit team who genuinely enjoy working together. We’re looking forward to the next twenty years of Bear Plumbing!